OOPS! No one likes it when there is a spill on the carpet,but with the help of this spotting guide there is a good chance it can be removed. To help you be successful we have provided this information for your convenience as a basic “do it yourself” guide for 6 common spots. permanent, white, bleached out spot in your otherwise beautiful carpeting. Some products may set the stain making it impossible to remove in the future. Residue – Some cleaning solutions are over applied or not rinsed out which leaves residue in the carpet that attracts dirt making the spot worse than before. Over-wetting – In your efforts you may over wet the carpetor not dry it quick enough which causes browning or wicking. 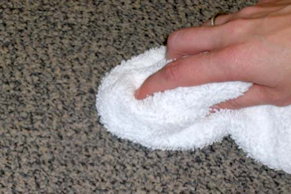 Improper procedures – Pile/Yarn distortion can result by harsh scrubbing or rubbing of the carpet. This is not a substitute for professional services! Preferred Carpet Care has professional solutions, tools, experience and training in removing difficult stains and odors. Follow these recommendations at your own risk. While this information is offered in good faith and appropriate to the best of our knowledge, we accept no responsibility for claims arising from the treatments, products, or procedures suggested herein. 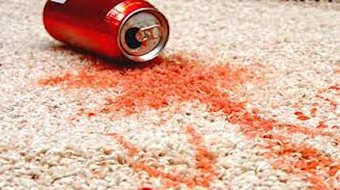 If stains fail to respond or any difficulties arise, immediately stop and contact Preferred Carpet Care at 206-276-3145. 1. Vacuum at the right frequency with a CRI-approved vacuum. 2. Clean spots and spills quickly with products that do not damage the carpet or cause it to re-soil more quickly. 3. Professionally deep clean your carpets every 12 to 18 months to remove embedded dirt and grime. Blot liquids – with a dry, white, absorbent cloth or or white paper toweling (no printing). Semi Solids – Scrape up with a rounded spoon. Blot, DO NOT SCRUB THE AREA! Scrubbing may cause pile distortion in the affected area. Continue to use a dry cloth or paper towels until the area is completely dry. Soak up as much of the liquid as you can. The more you can soak up, the less you’ll have to remove. For semi-solids, gently scrape up with a rounded spoon. 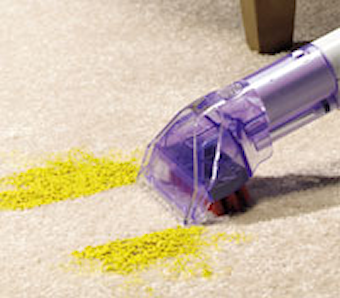 Solids should be broken up and vacuumed until completely removed. Work from the edges of the spill to the center to prevent the spot from spreading. If a light yellow/brown stain remains or a stain reappears after drying: Mix a solution of 1 part white vinegar and 2 parts water and moisten the stain. Then cover the spot with 10-15 layers of white paper towels and weigh them down with a flat heavy object such as a cookie sheet with books on top. (Ensure heavy objects won’t be damaged by moisture or transfer color) The white vinegar will help neutralize the stain and the papers towels absorb the stain as it dries to prevent wicking in the carpet. If you see improvement repeat this process. If you do not have success removing the stain yourself, call Preferred Carpet Care at 206-276-3145 to schedule a professional cleaning. These simple carpet spotting tips can help you maintain your carpets in between our professional carpet cleaning services. The goal when spot cleaning is to remove the spot as much as possible without making it worse. Before cleaning always pre-test the safety of any cleaning solution by applying several drops to an inconspicuous area (closet, under a couch) after 30 seconds rub gently with a clean white towel. Do not proceed if any carpet color transfers to the towel, or if the carpets color changes. Should color transfer you need professional service. Note: These Tips are not intended for your wool rugs or other natural fabrics. Detergent Solution: These simple Mix one teaspoonful of colorless, mild detergent or dish washing liquid in a cup of lukewarm water. A detergent solution can be made of hand soap or dish soap. Make sure the soap does not contain bleach or lanolin. Vinegar Solution: Mix one-third cup of white household vinegar with two-thirds cup of water. First blot with a clean absorbent cloth as much blood as possible. Never rub the stain as this will only push it deeper into the carpet fibers. 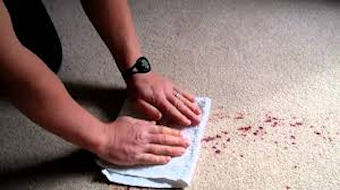 Keep blotting until you do not see any more residue transferring from the carpet to the towel (If already dried remove any solid material with a rounded spoon or the edge of a dull knife, vacuum then proceed). Next using a clean white cloth/sponge rinse the stain with cold water (hot might set the stain) If stain persists generously apply ammonia solution to remaining blood spot using a white cloth or sponge but not so much that you soak the backing. Wait a few minutes for solution to absorb then rinse with cool water blot dry as possible. For quicker drying, place clean, dry towel on top of wet area followed by a weight (something heavy on top a cookie sheet works well). Remove towel when dry usually 1 day. If the color is not completely removed after these attempts, then you need to call on the services of a professional carpet cleaner. 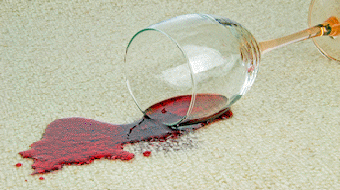 Preferred Carpet Care has numerous specialist treatments we can use to treat difficult blood stains. Time is of the essence the first thing you need to do is soak up as much of the red wine stain as you can. The more you can soak up, the less you’ll have to remove. 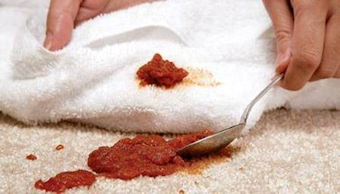 Be careful not to rub, as rubbing can push the stain deeper into the carpet’s fibers. wine stain, pour salt onto the affected area. The salt helps absorb the stain and can be quickly removed with a vacuum when you’re ready to treat the stain. Don’t have salt? Baking Soda can also be used to absorb the red wine stain. Next generously apply vinegar solution to the carpet using a white cloth or sponge but no so much that you soak the backing. Let vinegar solution dwell 15-20 minutes and blot dry with a clean towel. Sponge/cloth rinse with lukewarm water, blot dry to remove excess liquid and repeat as necessary. If stain is not coming out with just vinegar solution using a white cloth/sponge blot detergent solution on the stain. Using a gentle blotting motion, work the detergent into the stainand continue as needed until stain is gone. To remove detergent solution sponge/cloth rinse with lukewarm clean water and blot dry to remove excess liquid, repeat as necessary. For quicker drying, place clean, dry towel on top of wet area followed by a weight (something heavy on top a cookie sheet works well). leave overnight. If the color is not completely removed after these attempts, then you need to call on the services of a professional carpet cleaner. 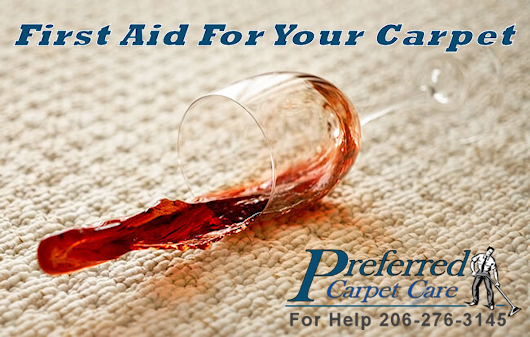 Preferred Carpet Care has numerous specialist treatments we can use to treat difficult wine stains. 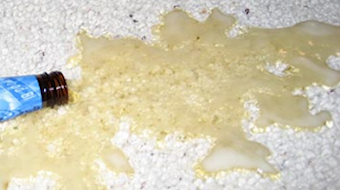 As soon as the spillage occurs use a clean white cloth and blot dry (do not rub) the area of the carpet where the spillage has occurred soaking up as much left-over liquid that may be still in your carpet. Next blot with vinegar solution using a white cloth or sponge, let dwell for 10-15 min. Blot rinse spot with cold tap water using a sponge or white cloth followed up with blotting dry to remove excess moisture. If spot is still present using a white cloth or sponge apply detergent solution using a gentle blotting motion, work the detergent into the stain and continue as needed until stain is gone. To remove detergent solution, sponge rinse treated area with clean water and blot dry to remove excess moisture. First, blot (do not rub) or extract as much moisture / coffee from the carpet. Use paper towels or white cloths towels blot until there isn’t any more coffee transfer. Next with a white cloth/sponge blot rinse with cold water to further dilute coffee, blot dry with a clean white towel to soak up the excess. If your coffee had cream, it may need anadditional treatment using a detergent solution. With a white cloth or sponge apply detergent solution using a gentle blotting motion, work the detergent into the stain and continue as needed until stain is gone. To remove detergent solution, cloth/sponge rinse treated area with clean water and blot dry to remove excess moisture. If the color is not completely removed,then you may need to call on the services of a professional carpet cleaner. 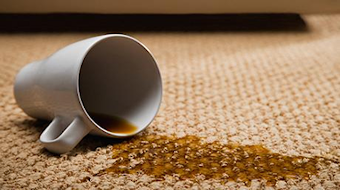 Preferred Carpet Care has specialist treatments we can use to treat difficult coffee stains. First, blot (do not rub) or extract as much moisture / soft drink from the carpet. Use paper towels or white cloth blot until there isn’t any more soft drink transfer. Next cloth/sponge rinse with cold water to further dilute, and blot dry with a clean white towel to soak up the excess. continue as needed until stain is gone. To remove detergent solution, cloth/sponge rinse treated area with clean water and blot dry to remove excess moisture. If stain still present, try blotting procedure with ammonia solution followed by blotting procedure with vinegar solution. Note a soft drink spill is usually deep into the backing resoling can be a major problem. Professional Steam cleaning usually solves this problem by thoroughly flushing out the soil attracting residues. itself and let to dry or set in. In a few hours, you will be able to ascertain whether or not it worked. The area can then be blotted with a cool, damp cloth to see if anymore of the rust lifts. If stain still present you can try lemon juice it’s a little stronger than vinegar. 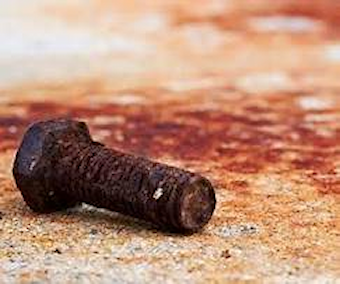 If neither of these seem to be working well, feel free to give Preferred Carpet Care a call we carry specialty products specifically designed for the treatment of rust spot in carpet. https://www.bissell.com/little-green-portable-carpet-cleaner-1400b to learn more about their products.